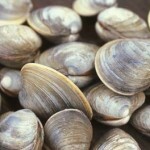 What Are Some Interesting Facts About a Clam? How Large Can Giant Clams Grow? How Could Evolution Have Occurred? One of the necessary doctrines of evolution is the denial of a world catastrophe such as the flood of Noah. This is because such a disaster would obviously cause the earth to appear to be much older than it is. Without a very old world, there is insufficient time for evolution to occur here. 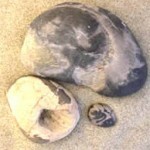 Clam fossils present embarrassing evidence for such a flood. Clams are known as bivalve mollusks. Clams are similar to the Venus Flytrap which we discussed in another article. They both have two valves, hinged, with the ability to close tightly very quickly. This makes it difficult for predators to get the clam itself. Clams eat by filtering plankton out of the water as it passes through. They are prey to sharks and squid. If they survive that, clams will live 40-60 years. They grow quickly in the first ten years but slow down to only 1 mm per year after 35. Most clams are a few inches long. However, in the Pacific and Indian Oceans are found giant clams called the bear’s paw clams. Each weighs over 500 pounds and can be 4 feet long! This is larger than the giant clam shell fossils found in Papua New Guinea that are a little over 3 feet long and weigh 220 pounds. These are estimated to be 400,000 years old. Clams haven’t changed much over the years, have they? When a clam dies of natural causes, within hours, the shell opens. This is why shorelines contain so many single shells for collectors to find. So if a buried clamshell is found closed, it would indicate that the clam was buried suddenly without time to open. All over the world fossil clam graveyards are found containing millions of clams tightly packed together with the shells shut. In one such fossil graveyard in Halkirk, Alberta, Canada, these clams are buried in sheets of ironstone. Such fossils are also found at higher elevations, far from the natural environment of clams today. What does this all mean? Clam fossil beds speak of a catastrophe that would bury millions of marine creatures quickly. The Bible calls it the flood of Noah. Since these fossil clam beds are found all over the world, and high above their natural habitat, it can only mean that a global catastrophe such as described in the Bible has shaped the earth’s geography. As a result, the earth appears much older than it actually is. In other words, there isn’t enough time for evolution to have occurred, if it can occur at all. While elk hunting in Colorado about 15 years ago, I found a fossilized clam about the size of a half-dollar. I have hunted deer and elk most of my life(I’m 74) and this was a first for me. Most of my Calif hunts were at 4,000 feet. Ariz about 6,000 feet. The clam I found was at about 12,000 feet. Failed to mention. The clam was in the closed position.